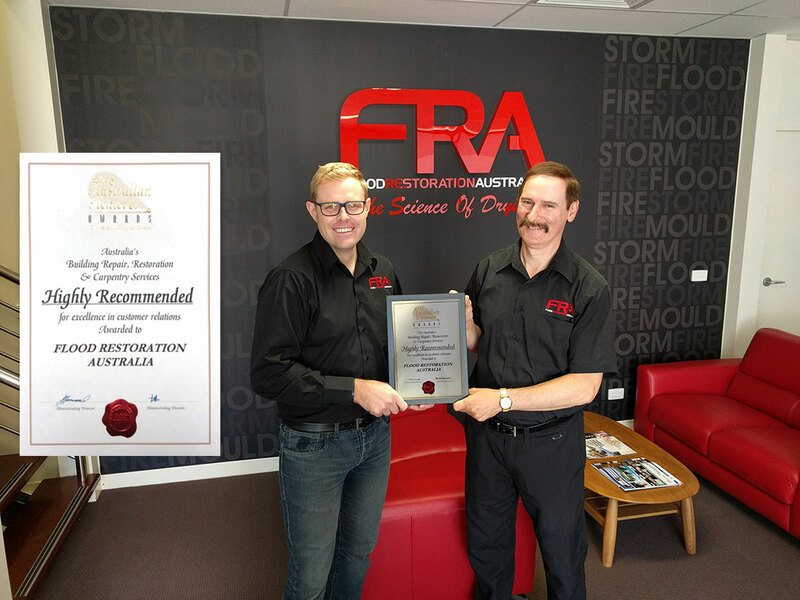 At FRA, we are delighted to be one of the Highly Recommended Customer Service companies in Australia. This is because we care about our customers who are the reason we are in business. We have scored customer approval ratings averaging over 95% in four years. 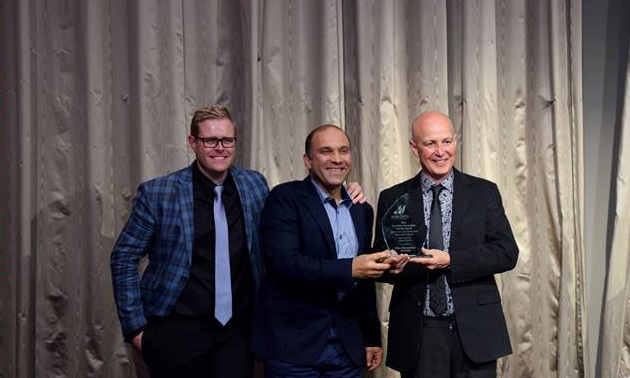 This is particularly welcomed as any approval above 80% is regarded by the Australian Achiever Awards as delivering exceptional customer service. We would like to extend a warm thank you to all of our customers that provided this valuable feedback, as we couldn’t have done it without you. So if you need support with Water, Fire, Smoke or Bio-hazards restoration, we are here to help. We are able to assist anyone in need from Insurers, Brokers, Local Government, Building Management, Commercial Buildings or Domestic homes. We care about people no matter how large or small the organization. With over 20 years of experience in the industry, we continue to challenge ourselves to deliver even better results. FRA is delighted to win the Most Innovative Commercial Project for 2017 and we were a finalist for the Most Innovative Specialist Project for 2017. These awards are highly rated across the Restoration Industry throughout Australia. The Awards were accepted by the Managing Director of FRA, Mr Joe Bonfa. 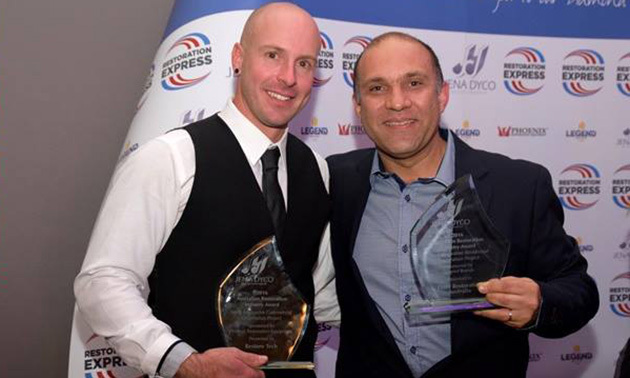 “It was humbling and fills me with enormous pride to accept the award on behalf of you all. Truth be told, I went up on stage to accept the award, but this award belongs to everyone and you should all be very proud, whether you directly or indirectly worked on his project, as it takes a whole company to win an award like this. Very special thanks and praise goes to Jack for an unbelievable effort in those trying conditions. Neville White for an unbelievable effort on the mountain, you were the glue that bound the project together, Johnny and his team at Floorless for a wonderful effort. To the Admin staff, Rochelle Spiers that had to compile the data worthy of being submitted and Peter Behm for his outstanding presentation, the attention to detail was brilliant”. 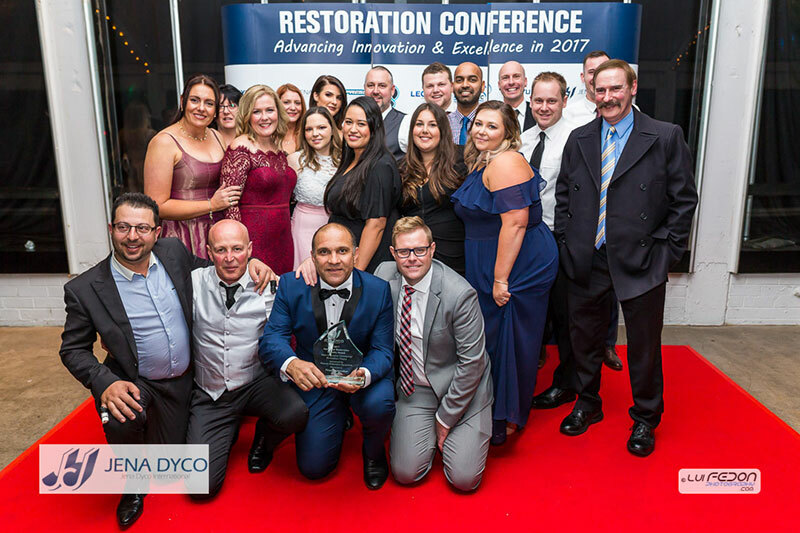 FRA is delighted to accept the award for the Most Innovative Domestic Project for 2016 and our newly acquired partner at Restore Tech in NSW has also taken out the prestigious Most Innovative Commercial Project for 2016. 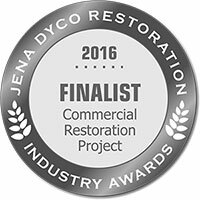 FRA was a finalist in Most Innovative Commercial Project category for 2016. 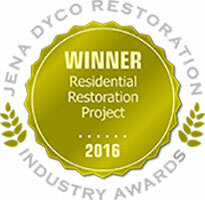 These awards are highly rated across the Restoration Industry throughout Australia. 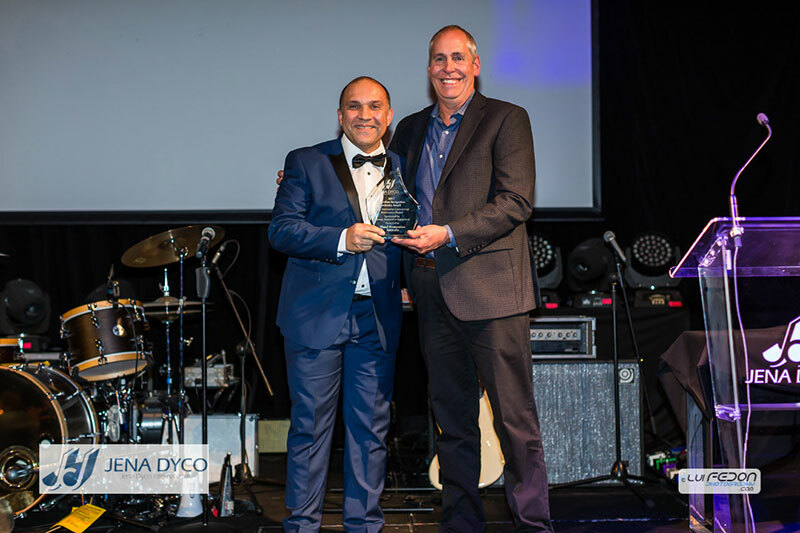 The Awards were accepted by the Managing Director of FRA, Mr. Joe Bonfa and by the FRA NSW State Manager Mr. Andrew Govett. “These awards are a real recognition of all the hard work you have put in over the course of the year. They belong to you! Without you all there is no FRA! I would personally like to thank the entire team, from the technicians, contractors, project managers, admin team and management! This is also a recognition for all the hard work Andrew and Misty have put in. I think that you will agree, they will do an amazing job heading up FRA NSW”. At FRA however, it’s also about our customers and clients without whom we could not win these awards. It’s your confidence and faith in us that we will always strive to deliver the best possible outcomes. We are humbled to receive these awards and keen to continue to strive to do our best in this great industry. 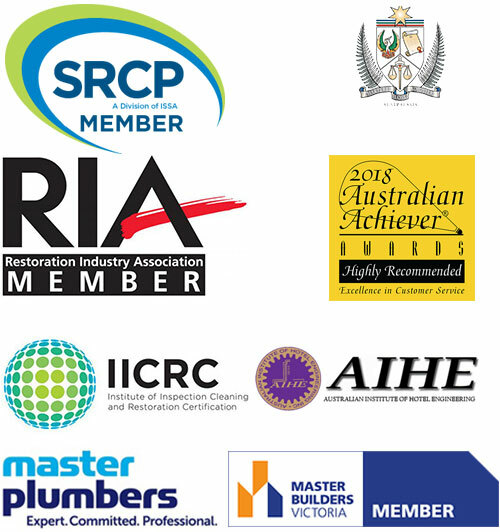 We are accredited members of the following industry associations. FRA has been an active member of SRCP and RIA for many years. Our staff are fully trained and compliant to IICRC standards. We are part of the Australasian Loss Adjusters and Australian Institute of Hotel Engineers. 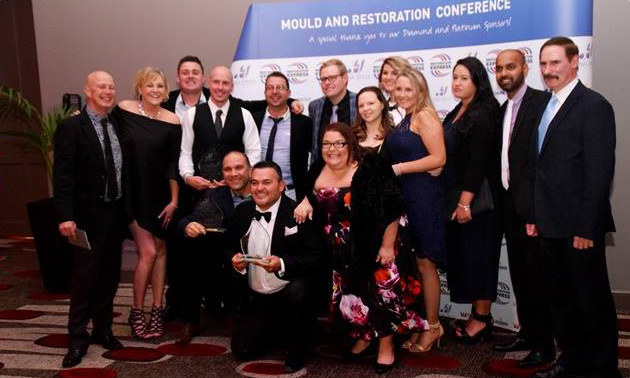 We are also proud to be part of the Master Plumbers Association and Master Builders Association as there are staff who work with FRA who were formerly from both of these important industries. FRA values our customers. 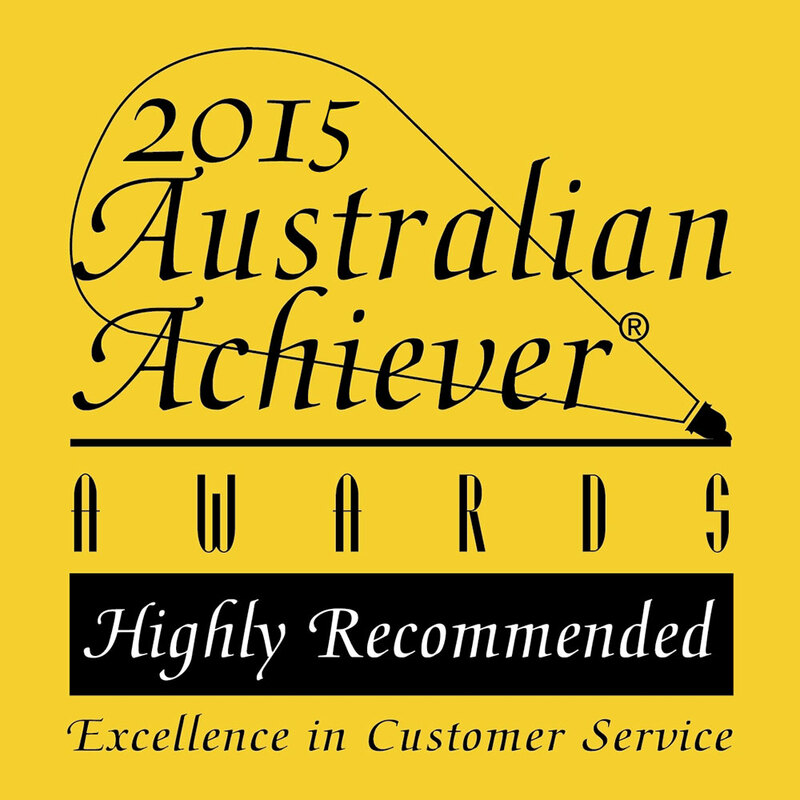 We have been fortunate enough to win the “Highly Recommended” Australian Achievers Award since 2015 for service to our customers. I would just like to pass on some feedback on both Levi & Eric who attended my damaged home in Werribee. They both were outstanding and efficient with a great work ethic. I had taken time off work to assist as they dismantled my kitchen and brought all of the associated crockery, glassware etc. outside for me to store away. Levi constantly provided information, answered all of my questions and nothing was too much trouble for him. Eric was an outstanding worker from go-to-whoa and has a wonderful attitude as well. This combination is often hard to find. They both ensured that a difficult time for us was just that little bit easier to handle. I manage a number of Delivery teams in my job, and people are often quick to complain, but slow to praise when a job is done well, so I thought I’d pass on some feedback for you. Just wanted to pass on some really great feedback on a claim that a colleague James and I attended yesterday in Port Melbourne. This claim was initially incorrectly allocated to a builder as it is a contents only policy, Body Corporate covers the Building. The Builder appointed FRA to pull out the floating floor. FRA were able to pull out all the floating floor without damaging the skirting boards or kitchen cabinetry which would not have been easy. This care has had a huge impact on our customer. She does not need to claim thru her Body Corp and pay a separate excess. The builders are now able to replace the flooring instead of us having to cash settle our liability for the claimable damages. Also, James made a few phone calls on site to ensure they were able to complete repairs and they will try their best to complete this without customer having to leave their home and stay in temporary accommodation, again, having a positive impact on our Customers life. Well done to FRA team and James for taking the time and effort which has a huge impact on the customers experience. As per my call today I just wanted to express my appreciation to Rob who came over today to go over our contents claim. We have not made a claim on house contents before so myself and partner were not sure of how complicated it would be. Firstly Rob arrived on time he introduced himself and immediately I felt at ease, he was outstanding in his approach with the claim explaining everything and pointing out many times if we had any concerns or questions to please ask him. He presented himself in a professional manner while at the same time remaining bright and cheerful which again made us feel at ease, he took photos of all the damaged items writing a description of them and explained in detail what the process would be after that. He left a business card and asked us not to hesitate to call if we had any other concerns or queries. Being our first claim we had many questions which Rob answered on the day. The only downside is that Rob having come across from the UK has adopted Essendon as his AFL team when clearly Richmond would have been a better option!! When Rob left we both commented on his professionalism and the fact that he made us both feel at ease with it all. Type of Loss: Mould Job – Burst hot water service resulting in flooding and condensation throughout. Type of Loss: Sewage Job – Blocked toilet resulting in sewage contamination throughout affecting structure and contents. “When we came home and found our home covered in toilet water I had no idea what the severity of the damage was. I contacted my insurance company and they sent FRA out to my property. Think about your home being destroyed in one night and not knowing what to do. When we saw our children crying and we were thinking we had lost our home for good. It’s a hard pill to swallow for anyone. FRA attended my property and before they commenced any recovery work, they spoke to my children asking how they were and what they had planned for the school holidays. To see my kids’ faces change from sad to smiles was amazing. Then they turned to us and said don’t worry as they are here to minimise the damage and help us get sorted immediately. Not only did the crew attend but also the two directors, who reassured me that all would be well. Since that day FRA has remained in contact with me asking how we were and if they could help us with anything. I had no hesitation or concern leaving my belongings in the hands of the team at FRA. This is professionalism at its finest. Type of Loss: Mould Job – Leaking roof over an extended period of time resulting rain water ingress causing mould contamination to structure and contents. “We suffered major water damage to our house which also led to mould damage. My whole house needed to be gutted – the flooring was pulled up, walls demolished and all my furniture was relocated. It was such a scary and stressful time. One of the first things Craig said to me was to add his number to my speed dial as we’d be in constant contact over the course of this repair. From that moment on, I felt Craig and his team at FRA had my back. Their knowledge, expertise and willingness to be totally transparent and answer any questions I had in an area foreign to me, helped me cope with this drama in my life. They were very impressive, extremely efficient, and very understanding. Because the repair work was due to damage, it was quite a trying time for us, and they made the process a lot easier. I had full confidence in them getting the job done well as I knew they wanted to do it properly. They have amazing work ethic. There was no shortage of information, they communicated everything to us. According to them, no question is dumb and they were happy to answer them all. Although ours was an insurance claim, I would pay anything for the work they did. Their time management was awesome. They went above and beyond. At midnight on New Years Eve they came to my property because of flooding. Their response to our call out was excellent. They are a great flood rescue service and they cleaned up and left everything spotless. They even gave us detailed reports which I found to be very important and professional. I was really happy with their very friendly and prompt service. 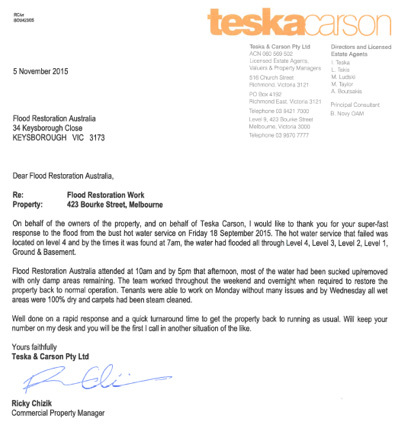 I found Flood Restoration Australia to be very professional and courteous. Our request for help was promptly attended to; they came straight away. Overall they were great to deal with. Flood Restoration Australia was really great when helping us out with flooding issues. They always arrived on time, and each day they never started too early or finished too late. They met our needs very well. They will be the first people we call if something like this ever comes up again. I cannot praise them highly enough. 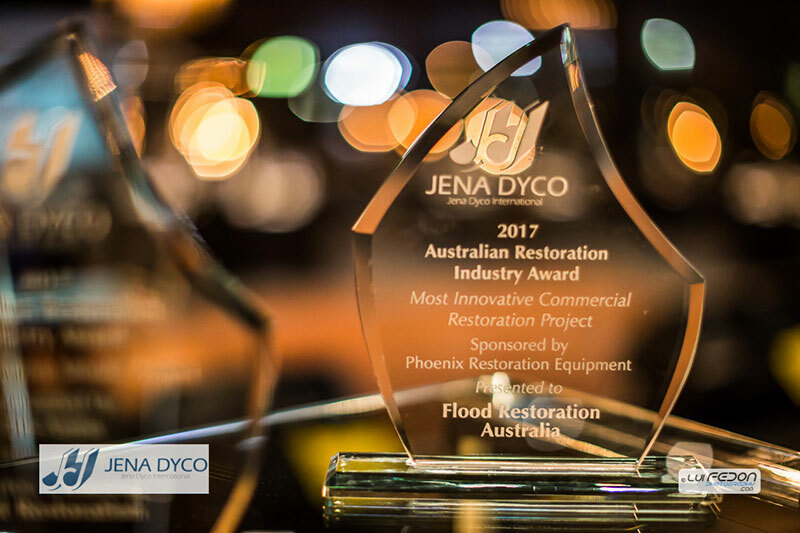 The whole ordeal when we flooded was quite stressful for me, and the team at Flood Restoration Australia were so professional and showed me a lot of empathy and compassion. They did not treat me like a number or just another job; they treated me like their family. Nothing was too hard or too much trouble, and they went above and beyond. I called them many times after hours, and they always got back to me straight away no matter what the time was. All the staff were fantastic but would like to make special mention of the two young men that came to the house first. They were very polite and efficient, listened, and got the job done. Also, Rebecca in the office was lovely; she was happy to listen, helped me and got someone to call me back immediately every time. I also dealt with Craig who was also amazing and did everything he could to get the job done without drama or distress to me. They were so understanding, professional, comforting and reassured me they could resolve my issues, which they did with professionalism and ease. Everything was completed thoroughly, and the attention to detail was second to none. I was very impressed with the Flood Restoration Australia; they did a great job. Rebecca in the office was excellent, very efficient, prompt, helpful and friendly. They were absolutely fantastic to deal with; so professional, well presented, and everyone was very friendly and polite. I cannot speak highly enough of them as they went above and beyond. Their level of service was outstanding.